Whether or not to leave your stable ROM for a beta version of a more functional and cooler looking one has always been a tough decision, but here’s hoping we’ll help you with it by giving you more details on what you are getting and at what cost. Let’s start with the downsides of the beta release. In fact the latest leaked ROM (build number XXDLH6) only has one major issue, and it’s a rather big deal. We flashed it on two different Galaxy S III units and both of them had issues with their Wi-Fi connectivity. It refused to work with some hotspots and it was painfully slow on most of the others. Unless you have a data plan that you can fall back to this is quite the usability issue and it’s the main reason why you might want to stay away from this build for now. Everything else seemed to work fine, or at least for us it did. Here is a rundown of the software goodies that might make you want to live with the shoddy Wi-Fi and get the beta running on your Samsung Galaxy S III right now. You can see them in action in the following video that we prepared for you. We start with Project Butter that we all heard so much about. Truth is it doesn’t make too great a difference on a powerhouse like the Galaxy S III. The smartphone’s UI was always really fluid and you need to look really close to spot the differences. Still, the app drawer animation is now even smoother and so are the other transition effects around the menu. There are several changes and tweaks to the UI layot as well. The settings section has been reorganized and Google Now is on board. The notification area has been updated as well and there are a few new TouchWiz goodies too. Google Now gets activated with a press-and-hold of the menu button. You can either type or talk to it and the app will give you one of its info cards (if available) and read you its contents aloud (you can disable this from the app settings if you don’t need it). If there’s no card to help with the answer to your question Google now will initiate a Google Search. The notification area has a few tricks to show off – brightness control, reorganized status bar (it now shows a bigger clock and the date) on top and expandable notifications. The settings menu has been reorganized – the voice settings, the lockscreen and accounts options are now brought to the top – you no longer need to dig into the menu to find them. The latest version of TouchWiz offers updated apps and a few new widgets. The latter are part of the Mode change setting where you can choose two types of homescreens – Basic and Easy. The two modes offer a pre-defined set of widgets. Basic is the default one and we all have already seen it – every Galaxy S III (ICS-powered) comes with this arrangement out of box. The Easy mode replaces the default widgets with a few completely new ones – they are very big and give you quick access to the most important functions straight from your homescreen (no menu digging). The best part of those two modes though is that you customize both as you please and your Galaxy S III will save the changes. That way you can easily create two different layouts, e.g. work and fun or travel and home and alternate between them quickly. And while we are talking about widgets, we should talk about their new behavior – they now support automatic resize and reshuffling. Let’s say you are trying to add a new widget on a homescreen, but the ones you’ve already put there need to be repositioned. Well, they’ll do that automatically for you. If the widget you are trying to add is bigger than the available space but supports resize then it will automatically shrink to fit into the free area. Cool, right? As you’ve probably guessed there is no Flash support on board, but you can always try and sideload the Jelly Bean-compatible APK that the guys over at XDA-Developers cooked up. You are surely familiar with the awesome trick called pop-up play. In case you need a refresh though – it brings the video you are currently playing to a small floating window and you can use other apps on the phone while still watching this video. The new firmware allows you to resize this pop-up window for even further customization. The Jelly Bean update replaces the S Memo app with a newer one called S Note lite. It does the same as what S Note did, but adds a few new features. You can record sounds and attach them to the note directly, and you can also add most of the common multimedia formats quite easily. Offline voice typing premieres with the Jelly Bean update too. You can download the languages you need (about 20MB per language pack) and use voice recognition without an internet connection. It’s quite handy when you are abroad. 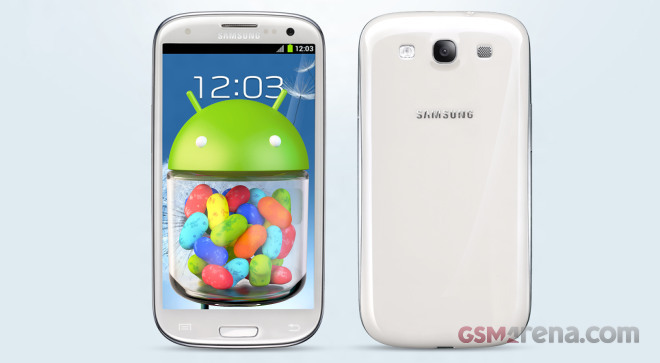 All in all the Samsung Galaxy S III Jelly Bean update seems to offer quite a lot of new features and we can’t see many people being left disappointed by it. We’ll be doing a detailed preview in the following days, shedding even more light on the new features and optimizations, so stay tuned and feel free to post any questions you want answered in the comments section below. For more info on how to get the ROM, go here. Keep in mind that there are some Wi-Fi issues, so you may experience problems with connectivity and stability.